Lehane Environmental are permitted waste collectors and can provide for the efficient servicing of your Septic Tank and Biocycle unit. Septic Tanks should be serviced at least annually to ensure the proper functioning of same. Regular maintenance of your Septic Tank will serve to protect your soakway and percolation area and will minimise the risk of having to replace either. The EPA recommends to de-sludge a septic tank at least once a year but this varies with the system’s capacity and use. You must de-sludge the septic tank if scum is present in the second chamber or if the sludge comes up to about 400mm from the bottom of the tank. A minimum of 75mm of sludge should remain in the tank to assist in the reseeding of the new sludge. Regular maintenance is required to ensure that the septic tank operates effectively and that solids do not enter the percolation area and clog the distribution pipe work. The Waste Collection Permit Regulations came into force in 2001. Anybody, other than a local authority, who collects waste for the purposes of profit or reward, is required by law to hold a Waste Collection Permit. The WCP must specify the waste type, corresponding EWC code (Septic Tank Waste = 200304) and Final Destination (Treatment Facility). A list of Permitted Waste Collectors is available from the National Waste Collection Permit Office (NWCPO). To ensure that the entity emptying your Septic Tank / Bio-cycle Unit are permitted to do so, please check the website of the NWCPO by following the link above. Waste Type: Septic Tank De-sludging. Why not contact your neighbours to establish if they also need their septic tank emptied? Both of you can enjoy the substantial savings – c 15 – 20 % ! 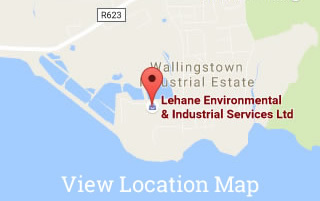 Lehane Environmental also provide for the dewatering of your Septic Tank or Biocycle Unit onsite thus reducing the volume of waste requiring offsite disposal and replenishing your septic tank with bacteria rich water. For difficult to reach Septic Tanks and Biocycle Treatment Units we can supply a high powered suction unit which is capable of desludging tanks up to 200mtr from the nearest access point. We can also provide ancillary services such as drain and sewer cleaning, CCTV surveys and repairs to septic tanks, percolation and drains.